Easy way for your users to get access to flespi from your service. 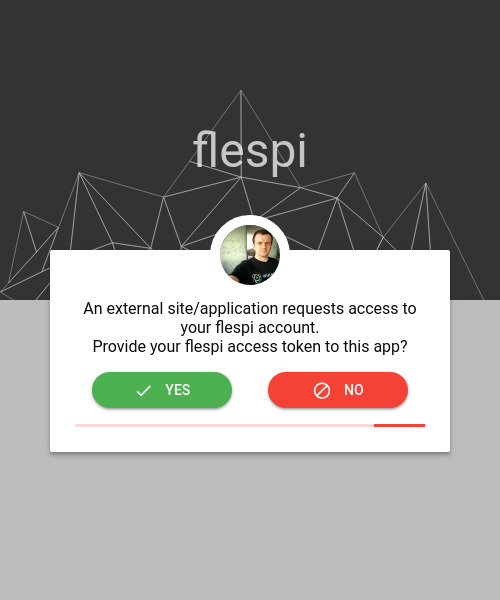 The latest update of the flespi panel brought a long-awaited feature to the public — users can now enable third-party websites to access their flespi token for authentication. Now obtaining the flespi token is easier than ever. The browsers of today allow tabs to “communicate” with one another — i.e. transfer certain data. This is the capability we relied on to implement authentication via flespi. All you need is subscribe to messages from other pages on your page, get a list of authentication links, and add the links to the necessary social media for authentication in flespi. The code above will open a new dialog at the center of the screen with no browser navigation elements. Now let’s add the listener for messages from other pages. Note! It’s important to check all messages since any window/tab/iframe open via a link can send a message, and the message may contain a random string. If the user agrees, flespi token gets into the message listener on your page and is available for use at your discretion. If the user denies access, the authentication page will close and the flespi token will not make it to your page. The example project is available on GitHub for anyone interested.